It is common for this time of year to do renovations to the home because of the buying and selling season of homes. This brings up a big question of what type of vanity should you put into your bathroom. When you put money into your home you want to make sure that you’re picking styles and natural stone that are in and that people actually want in their home. 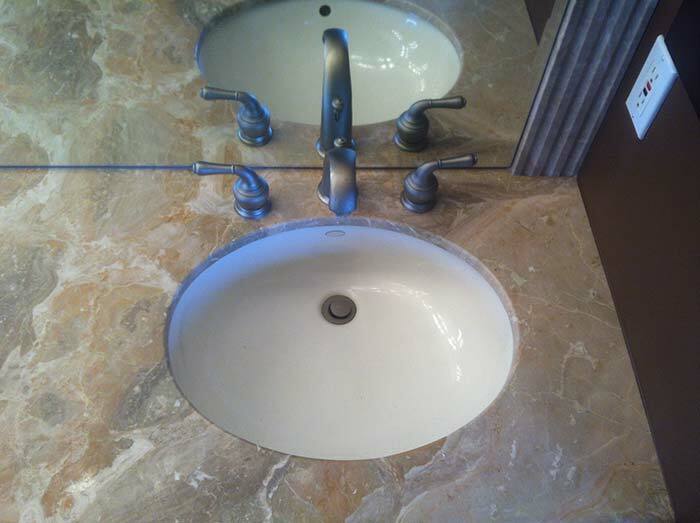 Stone Restorations Work wants to help you make the best decision when it comes to picking out the vanity you’re about to put in your home. When it comes to the appearance it is very much about what you like. However, you want to make sure that it flows with the rest of the house. The look of a home is important and something like a vanity can’t be easily changed without spending a bit of money so choosing wisely is important. Marble has a very veiny appearance to it and is easily recognizable. It also comes in popular home colors for the moment which is white and gray. Granite has a beautiful natural look about it and comes in various colors and patterns. Both marble and granite are very durable natural stones. There are some slight differences though that can be a make or break as for what you will put in your bathroom. Marble is much porous meaning that you have to make sure that you keep up with sealing it to ensure that liquids doesn’t seep into it causing is to stain. Granite is a much harder surface, so it can resist cracks and chips better than marble can. It can even withstand the hot temperatures to it with such resilience. There pricing on marble is more expensive than that of granite and the maintenance is similar in nature. They both have the need to be sealed regularly. Whichever stone you choose to go with it is important that you have a professional install it. Over the course of time though there are going to chips and possible cracks that may happen. When that happens make sure you call the professionals to come fix it and make it look like nothing ever happened. Stone Restorations can do both marble and granite repairs and make it shine like new again. Call us today for a free home estimate!